A couple of months ago, during a major heat wave, I traveled through the Sierra Nevada mountains from Sacramento to Reno and drove south on highway 395. The weather at over 4100 feet in Bishop, CA was 90 degrees, unusual for them, especially for September. This part of California is not well traveled, yet offers spectacular scenery and has but one highway, US395. Snows often close or restrict travel in the winter months, but the summers are quite nice. I explored many back roads to crystal clear mountain lakes and rivers this trip. This being a twilight and night photography blog, I’d like to share a few of the appropriate imagery. I stumbled on an old mining camp about 10 miles out of Bridgeport called the Chemung Mine. There were various buildings from 1902, including the miner’s cabin above. There was no lights nor anyone for miles around. This twilight shot was actually quite dark to the eye and the touch of fading light is reflected off the corrugated metal siding. In the background is the glow of the hamlet of Bridgeport and car lights on 395. Yes, that’s the Milky Way in the upper left. 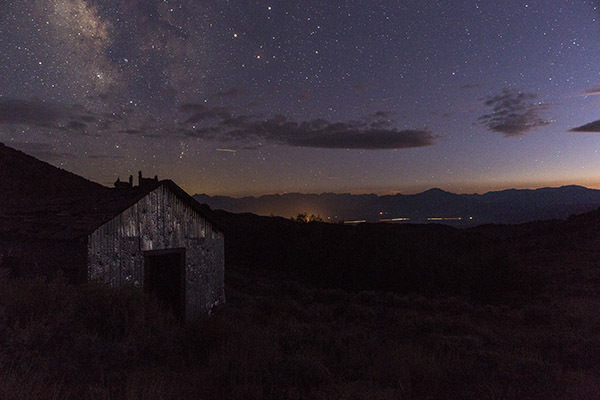 I concentrated on time-lapse photography that night which kept me from doing still work in the mining structures. You can only do so much, as I had two cameras on tripods shooting for hours and I had to stay out of the views of the cameras. This was shot with a third camera/tripod. After camping in the Chemung ghost town, the following morning I traveled on some 4-wheel-drive back roads and eventually rolled into Bodie the back way. Having been there so many times, even at night, I continued on. The next day, I took some 4×4 fire roads to the top of Mazourka Peak which is about half way between Bishop and Lone Pine in the White Mountains. 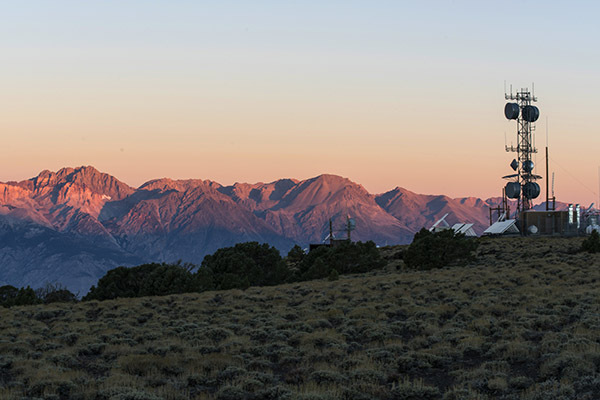 This vantage point, at nearly 10,000 feet, gave me a fabulous view of the Owens Valley and mighty Sierra to the west. 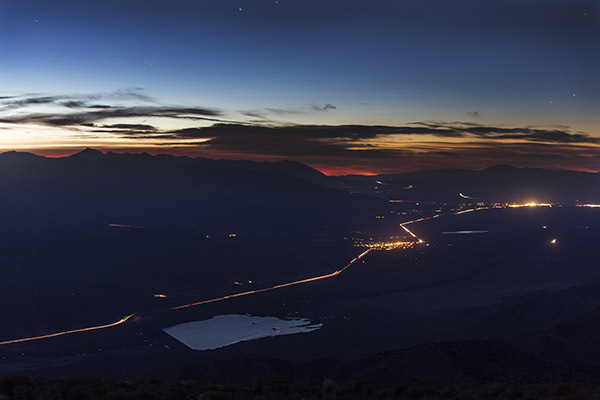 Here I’m looking south at the town of Independence and Lone Pine in the distance at twilight. I hiked to the other side of the mountain for this view looking north. The center right lights are of Bishop, about 30 miles away. Note the curved white light to the left of Bishop. That’s an aircraft on approach into the Eastern Sierra Regional Airport there. I had binoculars with me to view during the long exposures. 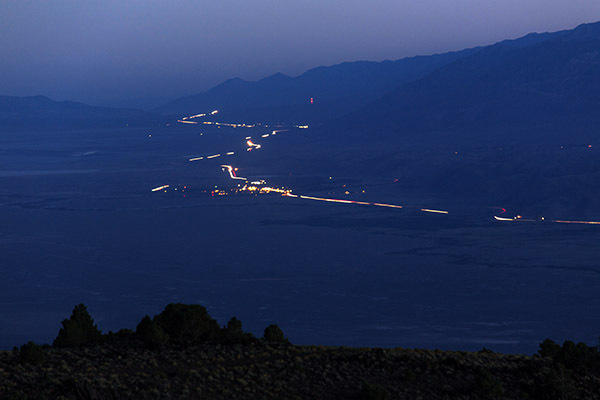 That is Tinemaha Reservoir, holding back the Owens River in the foreground, reflecting the blue twilight glow. At the top of the mountain, there are telephone repeaters. 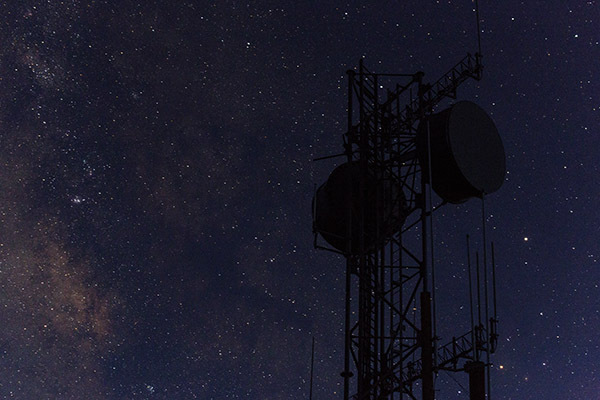 In this shot, I silhouetted the towers against the moonless sky and Milky Way. I did one shot with a bit of flashlight on the towers. Which is best is left up to your own opinion. Personally, I like the silhouetted views better. 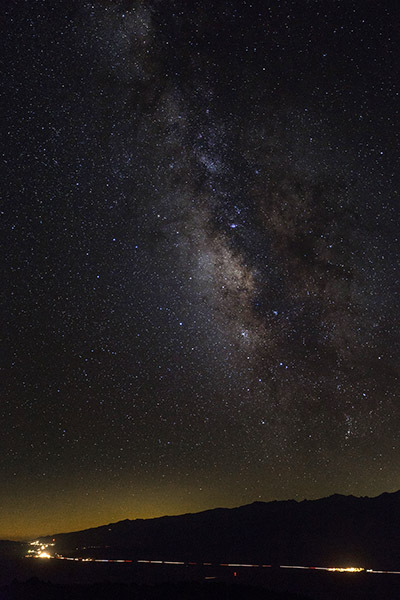 Here, the Milky Way looming above US395 shows the scale of the desert sky. 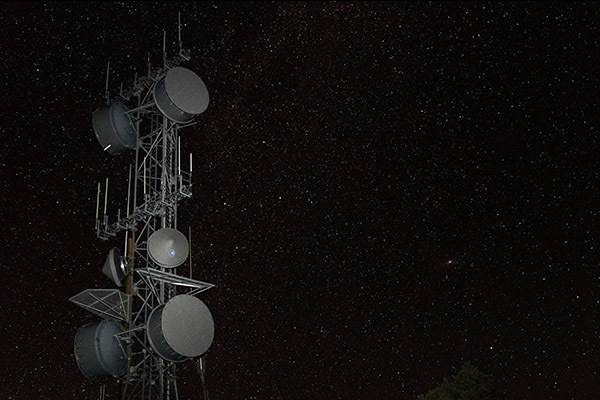 It’s rare to see the lights of the Milky Way intensely with man-made lighting in the same view. A vertical view enhances the sky. 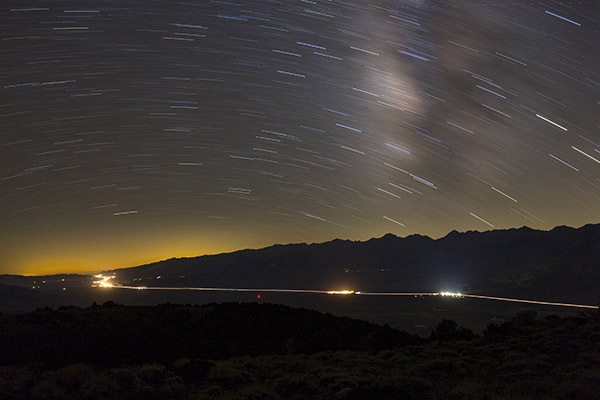 Here is a similar view, but a 10 minute exposure, showing star trails. Note the different colors of the stars on this moonless night. The Milky Way becomes a blur, looking more like a cloud compared to the previous 20 second long shot. The orange glow in the background are the lights of the Los Angeles basin, over 150 miles away. That shows how dark it was that night. You can really see the one highway though this area in these shots. 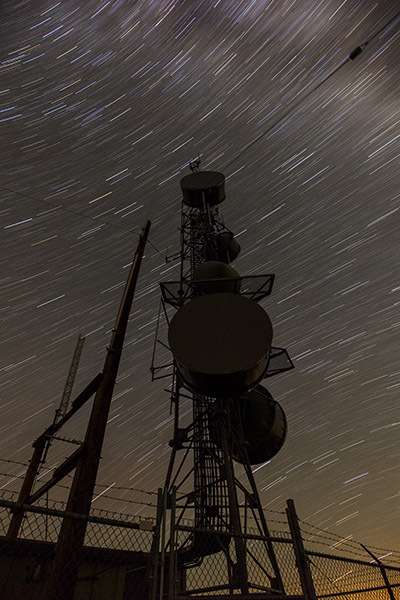 Here is another 10 minute exposure of the tower and the star trails. The cloud in the upper right is the Milky Way. I photographed for 4-5 hours that night in warm weather (80 degree) but very windy conditions (I estimate over 30 mph winds all night). I slept on top of the mountain and I found the wind lulled me to sleep. At dawn it was 50 degrees, and the wind made it feel much colder. I awoke at first light and shot a few time-lapses of the dawn. Here the early morning sun is illuminating the Sierra across the valley. As I left, I realized that this was probably the best weather this location has all year, as by December there will be snow and cold, fierce winds. There wasn’t a soul anywhere on this mountain and the facility was powered by solar and wind power and operated autonomously. This isolation is why I enjoy the desert so.